Striking design, excellent musical performance, and a strong value all the way around. 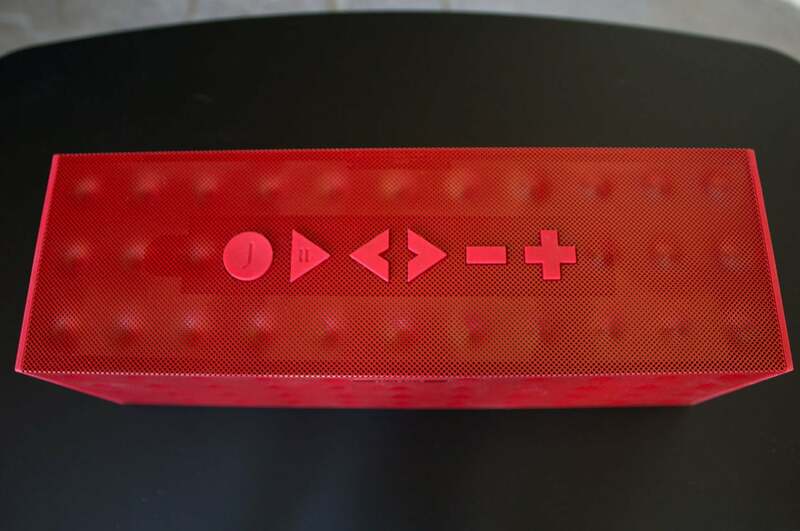 Jawbone—once known only for building Bluetooth headsets—put the audio industry on notice in more than five years ago when it introduced its Jambox, a diminutive speaker that delivered sound way out of proportion to its size. The Big Jambox is just what it sounds like: A bigger, beefier Bluetooth speaker with the very same industrial design. And a recent price reduction to $200 makes the Big Jambox an excellent deal. Don’t be misled by Jawbone’s marketing, which makes its Jambox speakers look as though they’d be of interest only to self-absorbed hipsters. The company reveals precious few details about the components that go into this speaker—including such basic information as the number and size of its drivers—and the industrial design is too cute by half, but trust me: this little speaker sounds terrific for both near-field listening and when you want to fill a mid-sized room with party tunes. The Big Jambox has far fewer features than either the Creative Sound Blaster Roar 2 or the JBL Xtreme. There’s an onboard mic (so you can use it as a speaker phone), a 3.5mm aux input—and that’s about it (the micro-USB port is there only for firmware updates and downloading new voices—more on that in a moment). A large passive bass radiator in the back of the enclosure delivers a surprisingly generous helping of low-end thump for the speaker’s size, especially when the speaker has a wall behind it to bounce that sound off. But it doesn’t lose much of that oomph even when it’s sitting on a countertop with nothing behind it. The large buttons on top of the Jambox can control the Bluetooth device you’re streaming your tunes from. Six oversized buttons on the top of the cabinet adjust the volume, let you pause playback and move up and down your playlist on a connected Bluetooth device. Pressing the “talk” button (the one with the “J”) pauses the music and announces the current time and the status of your battery. Holding the button down enables voice dialing on your connected smartphone. The voice will also make a short announcement when you reject an incoming call. You can download a whole variety of other voices for this function, which is fun for about five minutes before the novelty wears off. The speaker can store only one at a time, so you’ll need to cable up every time you want to change it. “Live Audio” is a new feature that recently became available with a firmware update. Enabling this, by holding down the plus/minus volume controls, enables a psychoacoustic trick that makes the Big Jambox’s sound stage remarkably wide—I’m talking a couple of feet to either side of the physical cabinet. Unfortunately, it makes vocals sound weirdly hollow. I didn’t care for it at all. Listening to some of my go-to tunes for speaker evaluations, I was impressed with the Big Jambox’s clarity, definition, and bass response. The riding hi-hat on Steely Dan’s “Jack of Speed,” from the band’s Two Against Nature CD (which I ripped and encoded in FLAC for playback on my Android smartphone), I was impressed with the speaker’s ability to render nice, fat bass lines without muting higher frequencies such as drummer’s snare-drum and hi-hat strikes. The speaker also did a great job with stereo separation, which can be challenging in small cabinets such as this. 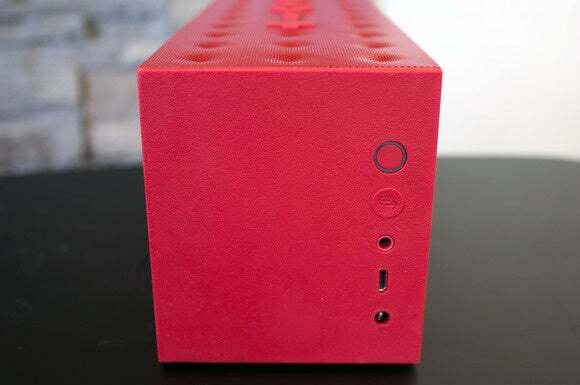 The Big Jambox is as light on features as Creative’s Sound Blaster Roar 2 is heavy. There’s an aux input and a micro-USB port for firmware updates. That’s it. Creative’s Sound Blaster Roar 2 delivers a lot more bang for the buck than the Big Jambox, but they’re both very strong speakers. In fact, I liked Jawbone’s offering just a little bit better when it came to filling a room with sound. The Big Jawbone’s industrial design is also much more appealing, and it’s easier to pick up and move from one room to another. As contrary as it sounds, you wouldn’t be paying too much for the Big Jawbone, even though the Roar 2 costs less and delivers more features. Both speakers are better values than JBL’s massive Xtreme. 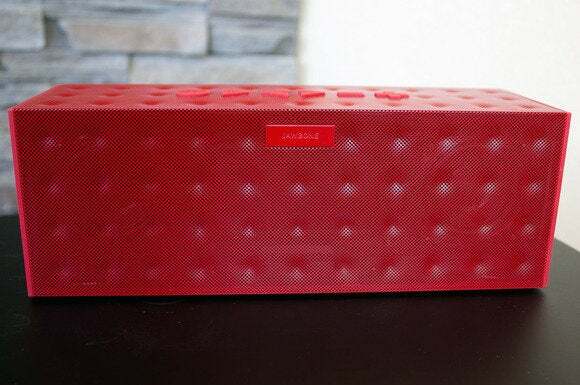 Ignore Jawbone’s marketing: The Big Jambox isn’t an overpriced bauble for gullible hipsters, it’s a strong speaker and a terrific value.